Aksaray ([ˈaksaɾaj]) is a city in the Central Anatolia region of Turkey and the capital district of Aksaray Province. According to 2009 census figures, the population of the province is 376 907 of which 171,423 live in the city of Aksaray. The district covers an area of 4,589 km2 (1,772 sq mi), and the average elevation is 980 m (3,215 ft), with the highest point being Mt. Hasan at 3,253 m (10,673 ft). Today Aksaray is a quiet mid-size city. Ihlara Valley and the other tourist attractions of Cappadocia are close, but as yet, Aksaray has not been very successful in attracting visitors to the city itself. 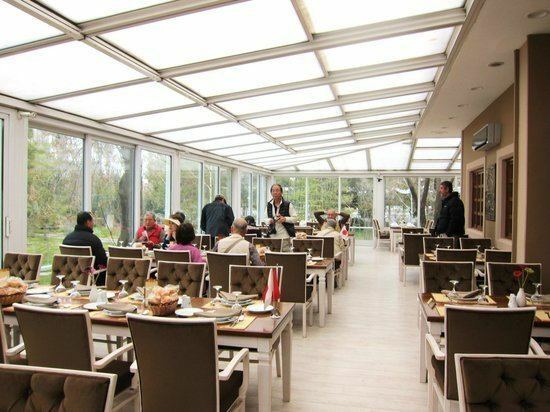 A new attraction in Aksaray city is Hünkarland, a large theme park with artificial waterfalls and which has immediately become a popular venue for Aksaray wedding parties. Other dishes include soups made with okra or yoghurt and a thick floury chicken stew called Arabaşı. Aksaray has a cold semi-arid climate (BSk) under the Köppen and either a hot summer continental climate (Dca) or hot summer oceanic (Doa) under the Trewartha classification. Hasan Dağı – a 3,000m volcano between Aksaray and Niğde, visible from the city. Aşıklı Höyük – a burial mound 25 km (16 mi) east of the city of Aksaray. Acemhöyük  – an early Bronze Age settlement, 18 km (11 mi) north-west of the city of Aksaray. The ancient Roman and Byzantine city of Nora, in the village of Helvadere near the city of Aksaray. Ihlara – a canyon, 40 km (25 mi) from the city of Aksaray, contains ancient churches, (9th century and earlier) carved into the valley walls and decorated with frescoes. Ervah cemetery in the city contains the tombs of 14th century Islamic leader Somuncu Baba and the scholar Cemaleddin'i Aksaray. The Runfire Cappadocia Ultramarathon, a multiday track running ultramarathon of desert concept, is held since 2012 annually in July. The race tours 244 km (152 mi) in six days through several places across Cappadocia reaching out to Lake Tuz. Karamanoğlu Camii – a large mosque in the city centre. The high church – on a steep rock 3 km (2 mi) from the city. 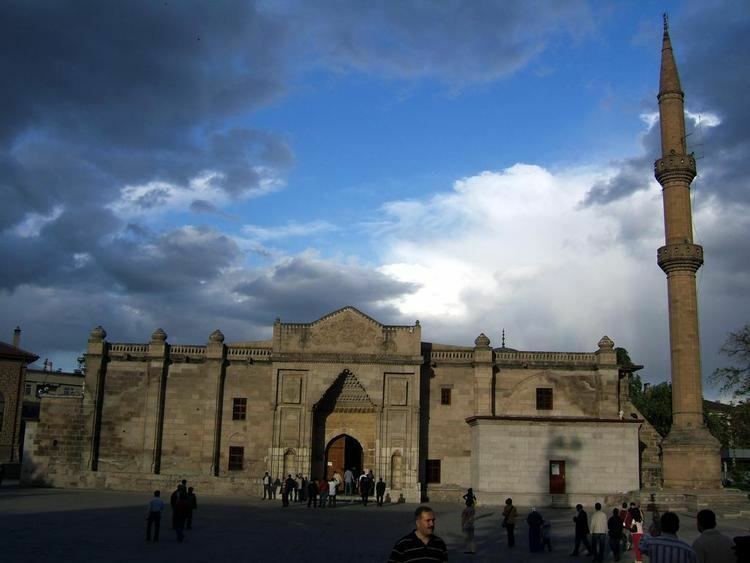 There are three monumental caravanserais in the neighbourhood of Aksaray. The best known is Sultan Han, located in the village Sultanhan about 40 km (25 mi) west of Aksaray. This fortified structure was built in 1229 (dated by inscription), during the reign of the Seljuk sultan Kayqubad I, by the Syrian architect Mohammed Bin Havlan El Dimaski (the work Dimasci indicating Damascus) along the trade route from Konya to Aksaray, leading to Persia (the Uzun Yolu). After it was partially destroyed by a fire, it was restored and extended in 1278 by the governor Seraceddin Ahmed Kerimeddin bin El Hasan during the reign of the sultan Kaykhusraw III. This monumental caravanserai then became the largest in Turkey. It is one of the best examples of Anatolian Seljuk architecture. One enters the Sultanhanı in the east through a monumental 13 m high marble gate (pishtaq) projecting from the fifty-meters wide front wall. The gate is enclosed by a pointed arch decorated with muqarnas corbels and a plaiting with elegant geometric patterns. The open courtyard (44 x 58 m) was used in the summer, while the covered ones (iwans) on both side were used during the winter. In the middle of the open courtyard stands a square stoned kiosk-mosque (kösk mesçidi), the oldest example in Turkey. The mosque on the second floor sits on a construction of four carved barrel-vaulted arches. The arcades on both sides of the inner courtyard served as stables and has accommodations above. At the other side of the courtyard is another arched entrance. It is equally decorated with a muqarnas niche, joggled voussoirs and interlocking geometric designs. The central aisle of the covered hall is covered with a barrel vault with transverse ribs. A short tower, capped by a dome, stands over the centre of the vault. This dome has an oculus, providing light and air to the hall.